My wife noticed this in the family archives. Here’s an RC multicopter big enough to ride on! I had a fun time talking to Mark Frauenfelder in episode 4 of his new podcast, Make: Talk! I feel like I could be getting more mileage out of my right foot. An Etsy portrait. Thanks, Danny. My friend Tess just made the cover of ReadyMade with her cool lamp design. Watch the sink slowly, all but disappear from the design . So you’ve borrowed a video projector and you’re finally going to host that Don Knotts film festival that you’ve always talked about. Well, Cannonball Run II doesn’t look that great on a beige wall, and you don’t have any white sheets to hang. Rest easy, with a trip to the fabric store and a few spare hours, you can make yourself an admirable projection screen. What you are going to need is some drapery blackout fabric. This stuff is a lightweight, white fabric with a rubbery coating on the back. It is sold at most fabric stores and is normally used to make a light-proof backing for curtains. The rubber coating makes it super opaque, which is perfect for making a highly reflective projection screen. 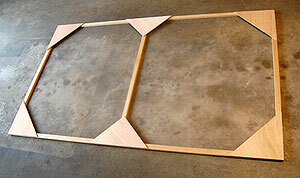 Figure out what aspect ratio and size screen that you would like, then build a frame to strech your blackout cloth over. I ripped down some 2×4′s that I had to make some 3/4 x 1 1/2 inch boards. 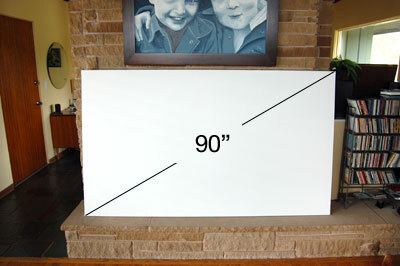 I built a 90 inch diagonal 16:9 frame from these and added an extra cross member to the center for the sake of rigidity. I then cut some 12 inch gussets, screwing and gluing them in place to reinforce all corner joints. This made for a rather stiff and lightweight frame. I used a staple gun to stretch the fabric over the frame. What you will end up with is a dirt cheap, lightweight, projection screen. If you ever upgrade to a retractable model with automatic masking, you can always use this thing as a painting canvas. This entry was posted on Saturday, December 8th, 2007 at 10:11 pm	and is filed under Easy Projects. You can follow any responses to this entry through the RSS 2.0 feed. Both comments and pings are currently closed. After you’ve stretched the canvas, paint it with a flat white paint. Why? Canvas is not opaque and suffers from a property called subsurface scattering. The light from the projector will penetrate the fibres and scatter back to the audience from various depths, leading to a certain amount of fuzziness in the image that no amount of focus-adjustment will eliminate. A coat or two of white paint will sharply reduce this scattering and give you a picture that can be more sharply focussed. Of course, if the projector you’re using exhibits screen-door artefacts (a black “grid” of lines between every pixel sometimes found in early DLP projectors) – a screen that has subsurface scattering can actually help to eliminate the screen-door effect, so YMMV. Which side of the fabric do you project onto? I did it fuzzy side out. seems to work well, but I think that I will also give the front side of the screen a coat of high hiding white paint like Crosius advised. You’ve missed a very cool and important part, which is “sizing” the canvas. The way artists stretch a canvas over a frame is not by hand (as you did, literally), but by…science! Canvas is made from cotton, a natural fiber, which shrinks when it comes into contact with water. So, the way you get a flawless, wrinkle-free canvas to paint on (or project on) is to staple the canvas on, but let it stay loose. Then, taking a paintbrush, paint a mixture of 1-part elmer’s glue (or primer paint) to 10 parts warm water across the loose canvas. The canvas will shrink, and become drum-tight within seconds. Follow with a thinned paint mixture and let dry. Perfect, super-stretched canvas. 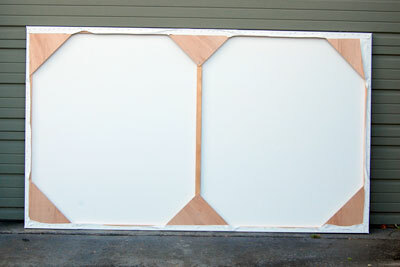 Another inexpensive and way easy projection screen can be made with a 4′x8′ sheet of white masonite covered wall-board. I got mine at Home Depot for about $35. Just hang it up as is – it’s a semi-glossy, very slightly pebbled, very white, hard surface that makes a great screen. Easy to clean, too. Yay for borrowed projectors and Don Knotts Film Festivals! I made practically the same frame with stiles and rails, but used some leftover Tyvek house wrap. It seems to be a good mix between surface scatter, and surface sheen. The audience sees a fairly clean image withoug any hotspots (like you might see when projecting against shower board or white board material).